Other than my sister who lives in Florida, just about everyone I know has been dealing with frigid temps, snow, ice storms and even more snow. As I write this post, I am hearing the weather report for Monday call for snow conditions with more school closings. Now this may seem a bit odd for those who live in snow regions, but the south just doesn't have the equipment to deal with something that shows up every few years. It's just easier for us to shut down and let it ride. The good thing is that it doesn't take too long before we are back on track. My daffodils have already sprouted and should be blooming any day now. Spent Saturday at the auction and came home with some nifty pieces of treasure. 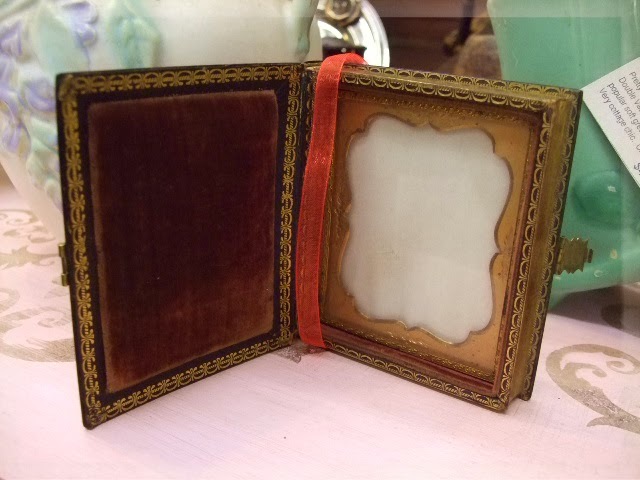 This lovely little Mother of Pearl and lacquer "book" with leather binding is actually an Asian inspired and rare antique, daguerreotype case. 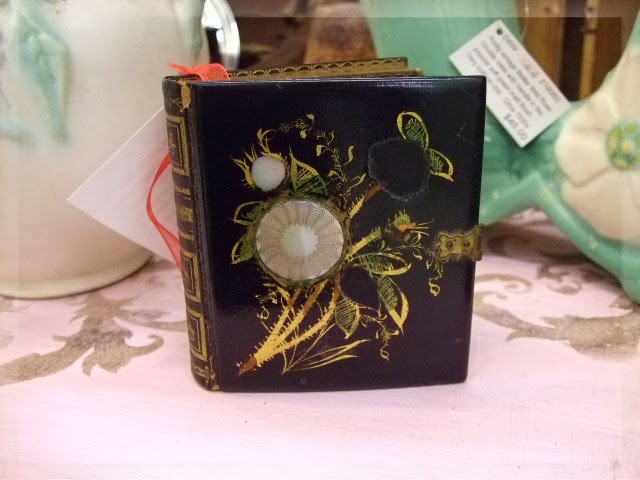 I have never come across a dag case like this and it is in marvelous condition. 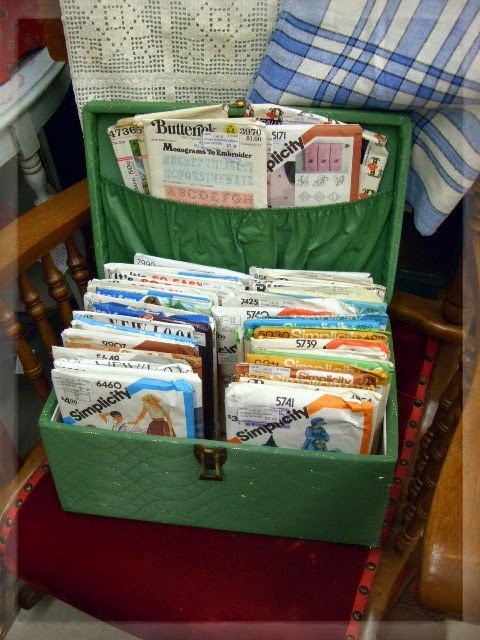 This was a find at one of my favorite haunts, Vintage Village, in Snellville. 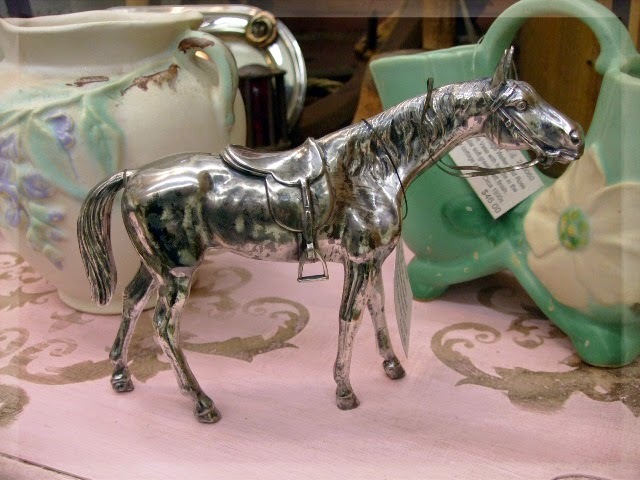 Gorgeous vintage silverplated Thoroughbred horse figurine by Jennings Brothers. Circa 1900s. Huge box of vintage patterns. Many from the mid 1970s through the 1980s. Lots of embroidery transfer patterns as well. 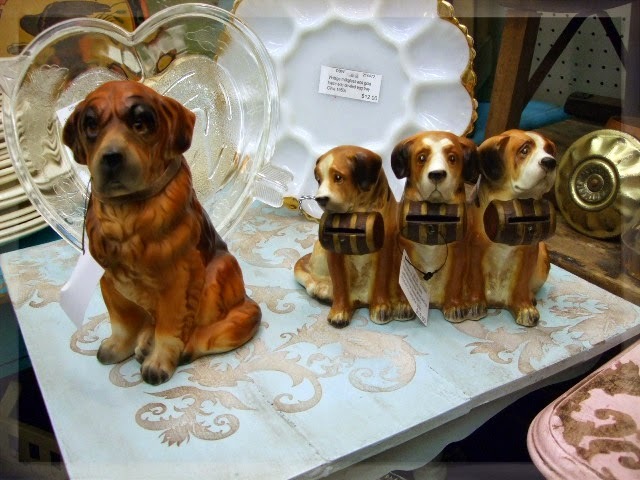 How cute are these vintage St. Bernard figurines? Just cha cha for the three Bernards that are a bank. All from the 1950s. 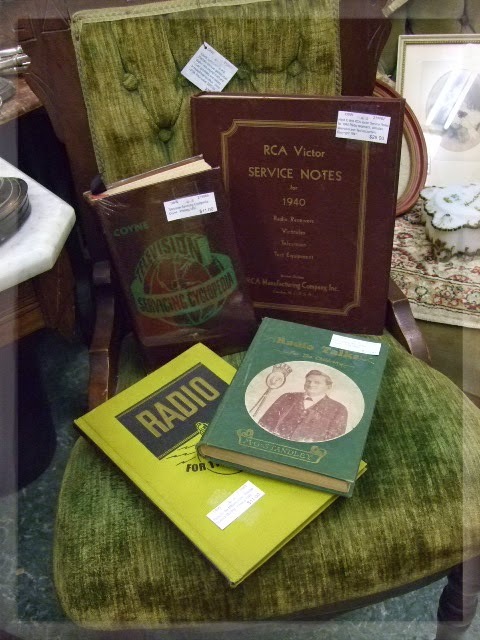 Nifty group of vintage Radio and Television service notes and radio talks books. Circa 1940s. The Service Notes Manuals are interesting with lots of pictures and schematics on how to do repairs. 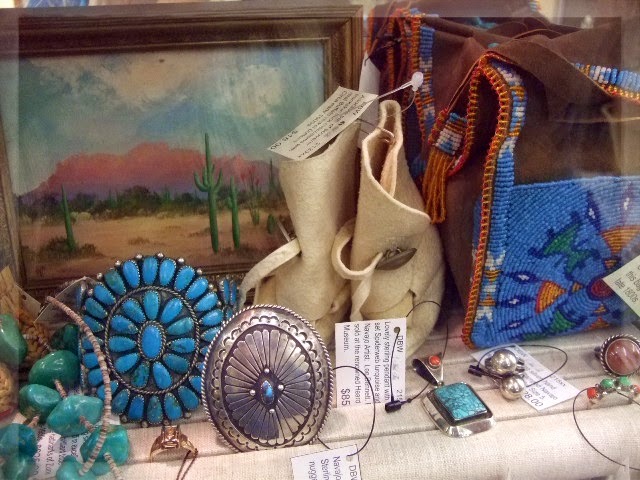 Brought in more turquoise and coral jewelry as these pieces are selling again. Coro pop it beads in lime green are so neat. Everyone girl had pop it beads in the 1960s. 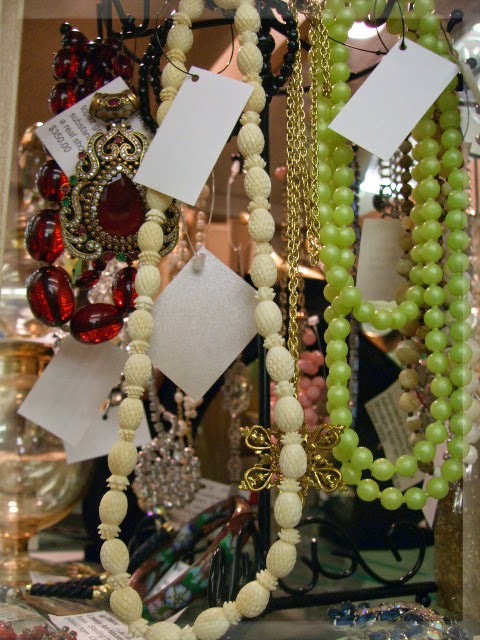 Also added a lovely hand carved, vegetable ivory pineapple bead necklace. Lovely mid century feathered pill box hat, very 1960s, very Jackie O.
Transferware moves as quickly as I can find it and bring it in. Added lots more blue this weekend as this color continues to be the most sought after. My main space is packed with lots of treasure. 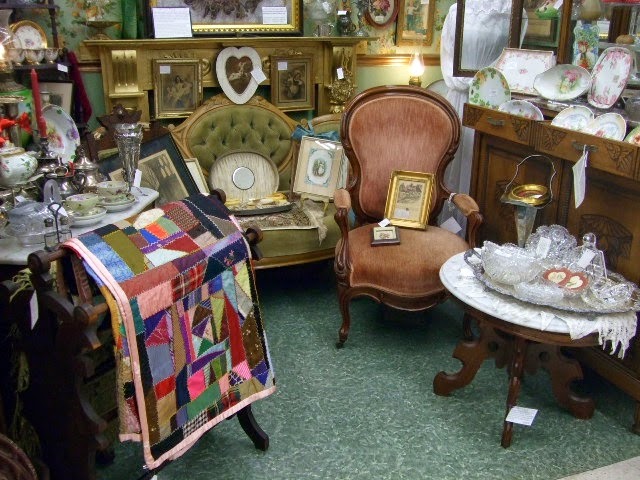 My Victorian space has lots of lovely antiques from the 1880s through the 1930s. 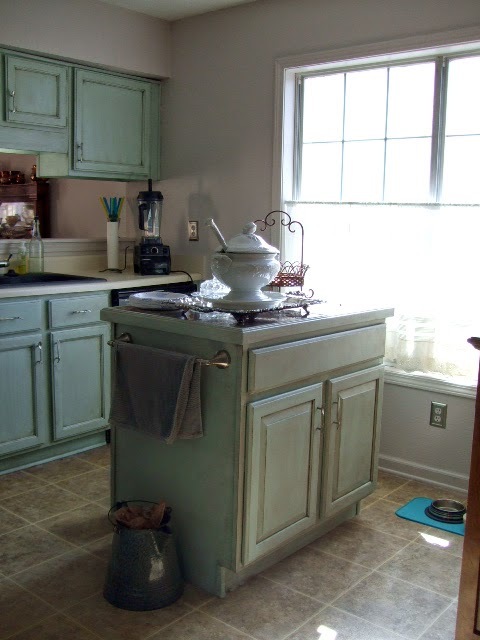 My big project over the winter was to chalk paint my kitchen cabinets. 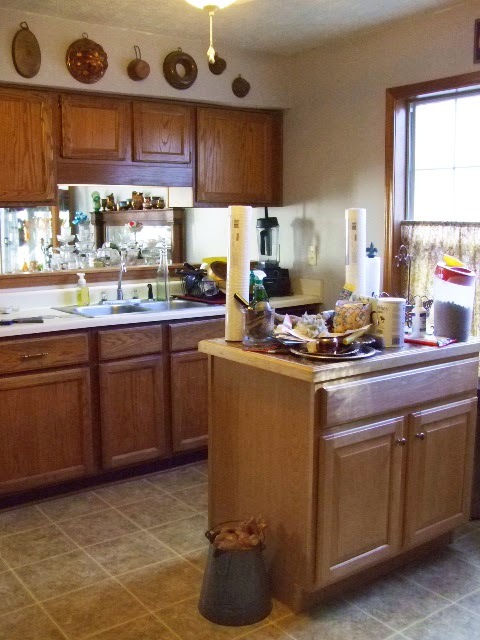 My home was built in 1981 and the kitchen has the original oak cabinets and although they were still structurally sound and in excellent condition, they are dated. 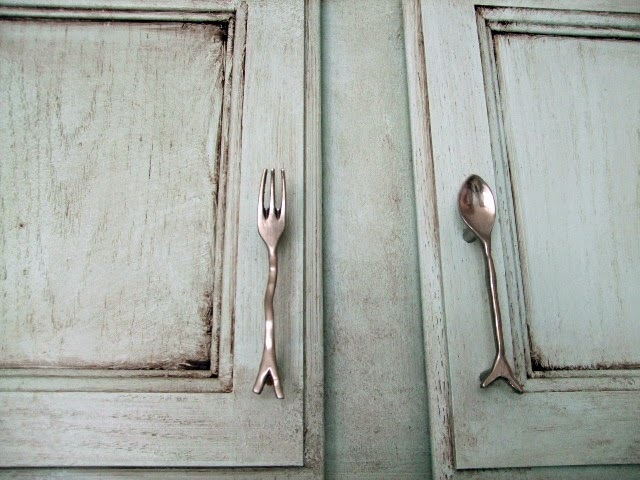 So rather than invest in the high cost of replacement cabinetry, I decided to chalk paint them instead. Where this seems like a rather big job, I had planned to complete this over my Christmas break. I actually got all of the prep and painting completed during that 12 day period and was able to move at my own pace. Of course. I also hung wall paper and repainted the walls and trim as well. 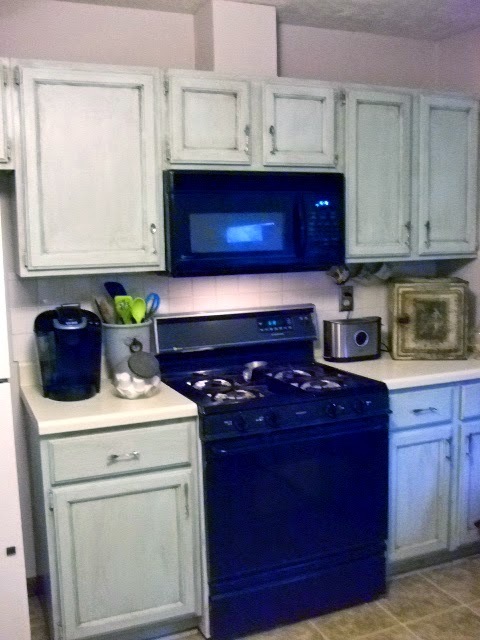 I am so pleased with the finished results and would highly recommend the chalk paint technique to anyone thinking of redoing their kitchen cabinets. 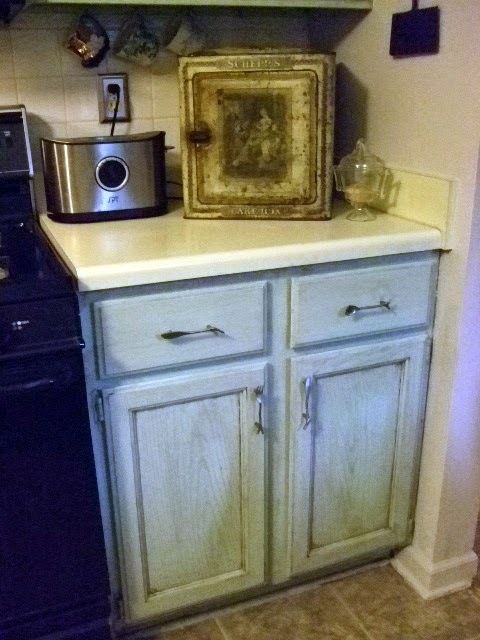 Original oak cabinets and a birch island. Aluminum twin sink. Never understood the appeal of these twins sinks. Always too small for me. I replaced it with a big farm sink with lots of room to do dishes and big pots. I chose Duck Egg blue as my color. So loving the soft color and it made my kitchen look twice the size. Because this is a kitchen I used a satin finish interior paint, cleaned and prepped the cabinets and then began the three coats of application that I wanted. Once the final coat had cured (3 days) I then applied the wax and Kona stain mix. Yup, I'm crazy about the finished results. Close up of the color and the pretty handles I added. Going to replace the appliances once my tax refund shows up. These are also original to the house and I wanted to upgrade. 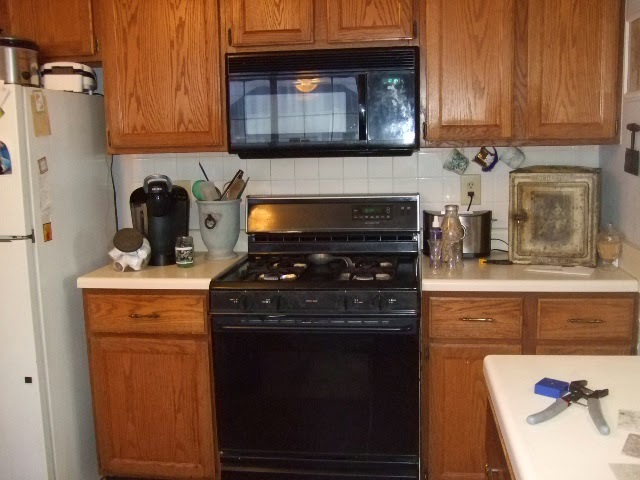 Even the old appliances look better. 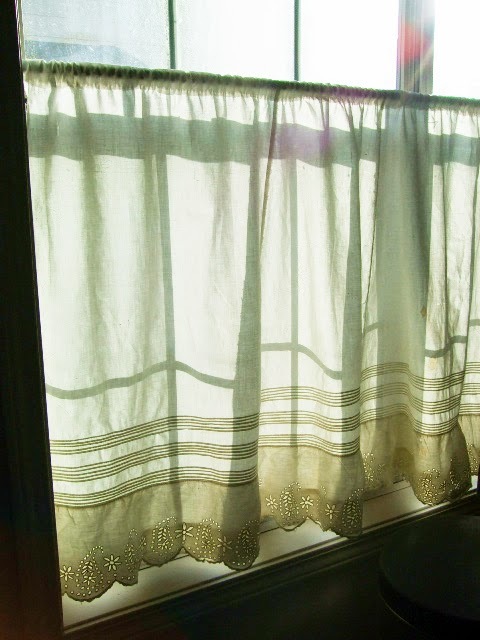 I replaced the cafe curtain with a Victorian petticoat. Yup, this was a "cutter" that I had purchased a few weeks back and had no real plans for it when I made the purchase. 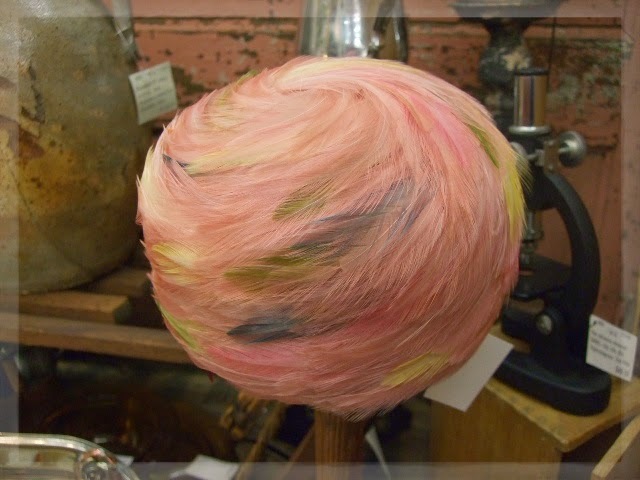 I wanted to keep the Romantic Farmhouse look and remembered this petticoat. Luckily, it belonged to a woman of great stature so I opened up one seam and it fit the large window beautifully. 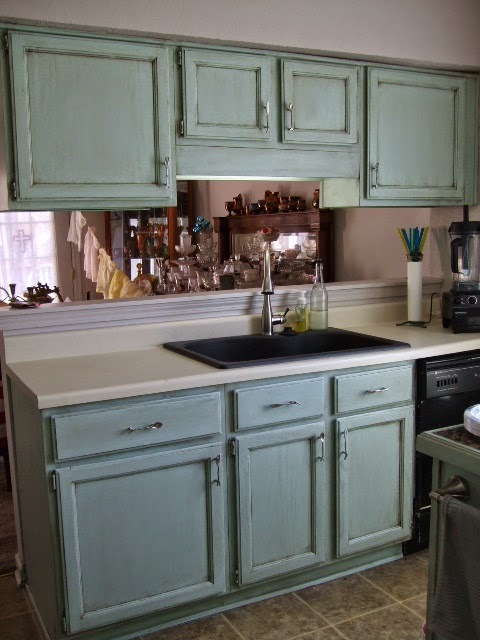 This was such a fun project to do and the painting cost was under $100.00 (and that included the cabinet hardware) to make this transformation. I would recommend it to anyone. 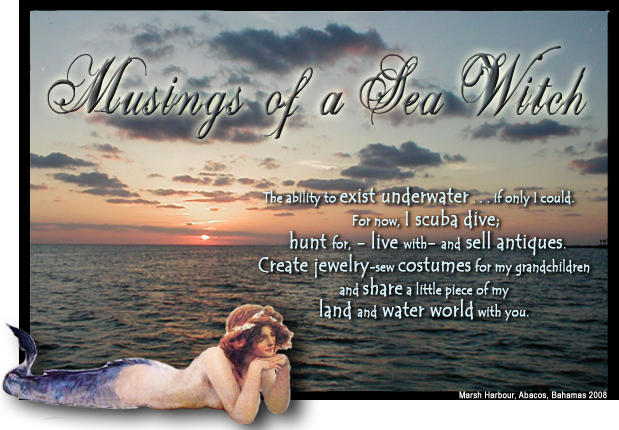 Blessings to you and those you love, Sea Witch. I turned around and went from December into January...wait, no, February! When did this happen? I think all of the work I have been doing in the kitchen (in between the full time job) that January just ran away from me. This with starting my taxes for 2014 and, yeah, it's February already. The crazy weather makes it difficult to complete paint jobs I want to do, but we finally had a few nice days so I was a painting fool and got a few projects started. Hope to have them finished by next weekend to put them in my spaces at the Buford Queen of Hearts. 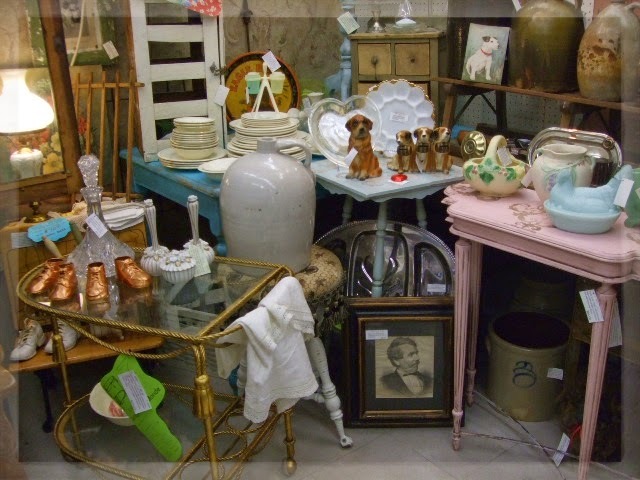 Did a little treasure hunting on Saturday and found some great pieces. 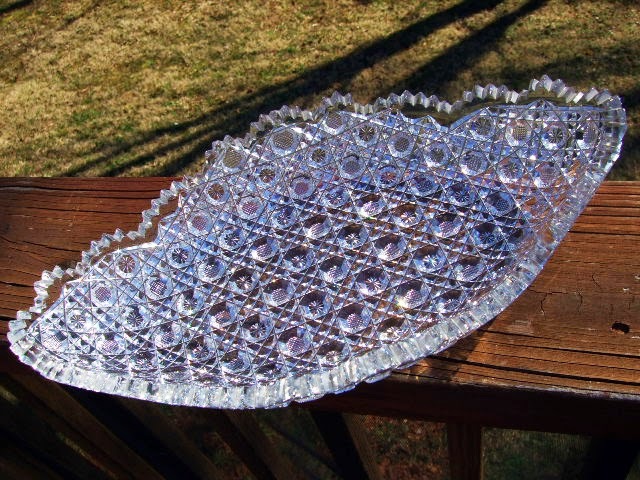 This gorgeous, American Brilliant cut crystal oval server. 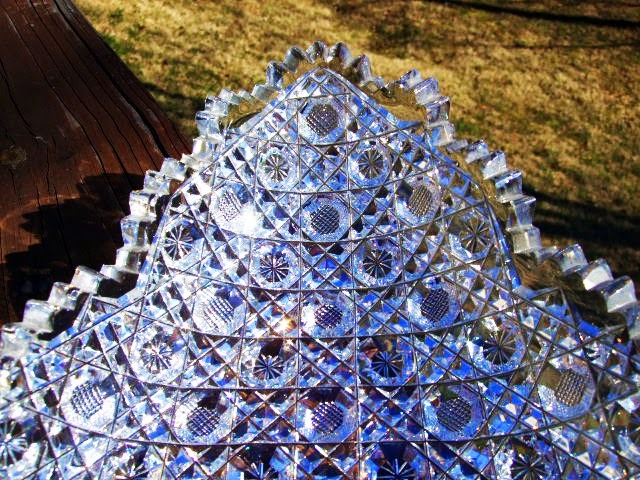 Large and in "Harvard" pattern, this piece just sparkles like diamonds. This is a keeper and I can't wait to use it over the holidays. Close up of the pattern. Just gorgeous and amazing cut work. 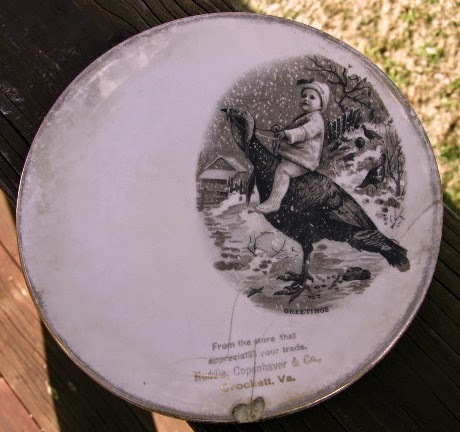 Pretty EAPG butter plate. 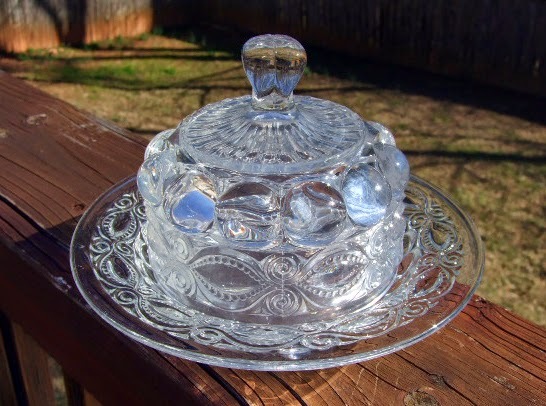 Do you use a butter dish? I do, as I only use real butter. :) I'm tempted to keep this sweet thing too. 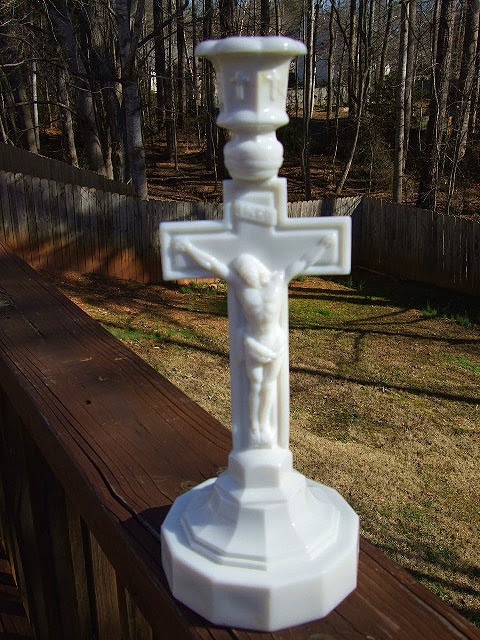 Nice, milk glass crucifix candlestick. 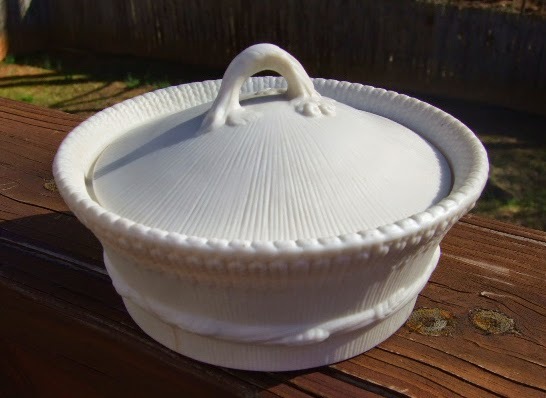 While this pretty little bisque finish covered dish may look quite unassuming, it hides the very thing I adore about some antiques. A pair of lead staples holding a broken lid together. 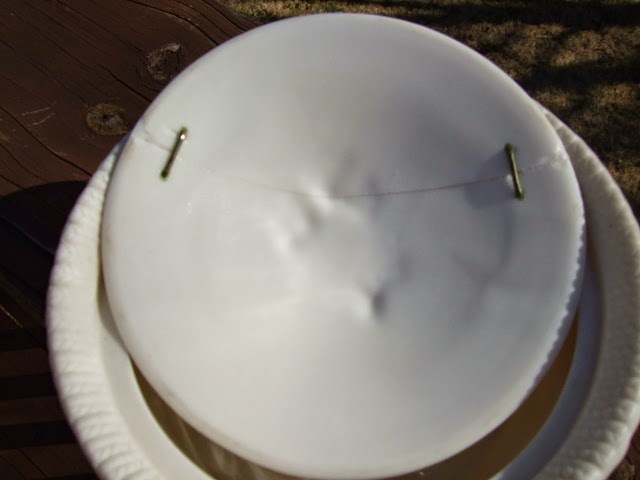 This type of inventive repair was popular in the late 1800s through the 1920s. 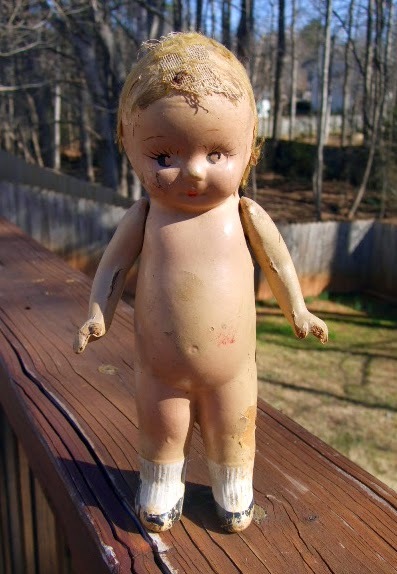 Sweet little celluloid doll with painted sock and shoes. Very 1920s. 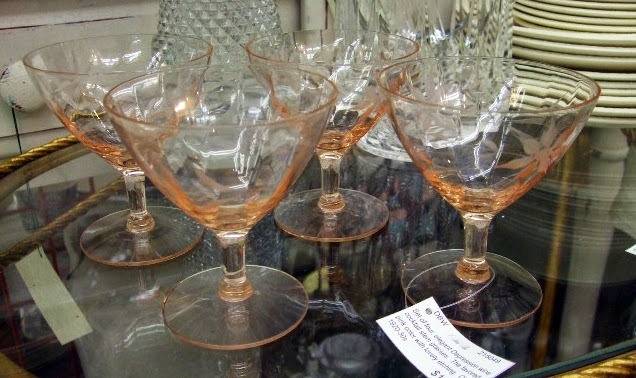 Set of four elegant Depression glass pink champagne cocktail glasses. 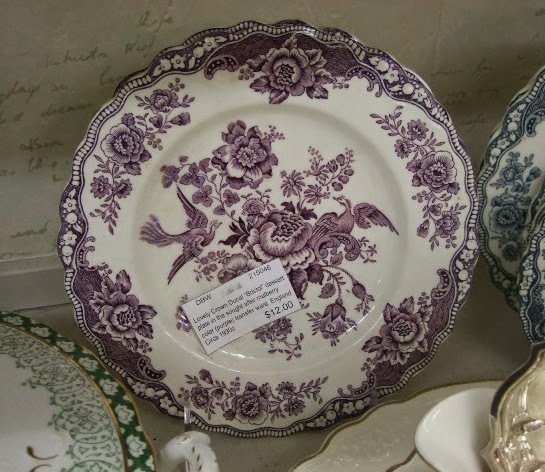 Etched with a lovely flower pattern, I brought these into my space today and they have sold already. 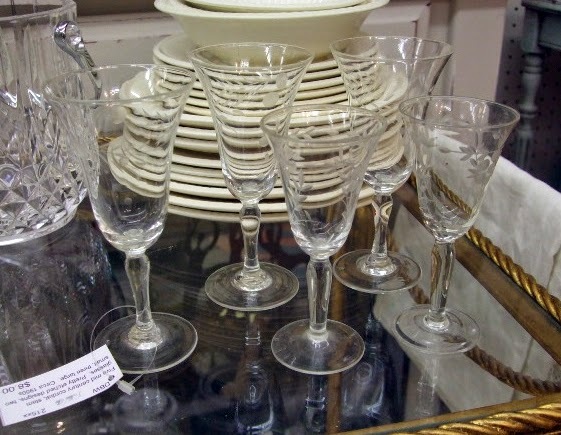 Sweet set of five, etched cordial glasses. All vintage from the 1950s. 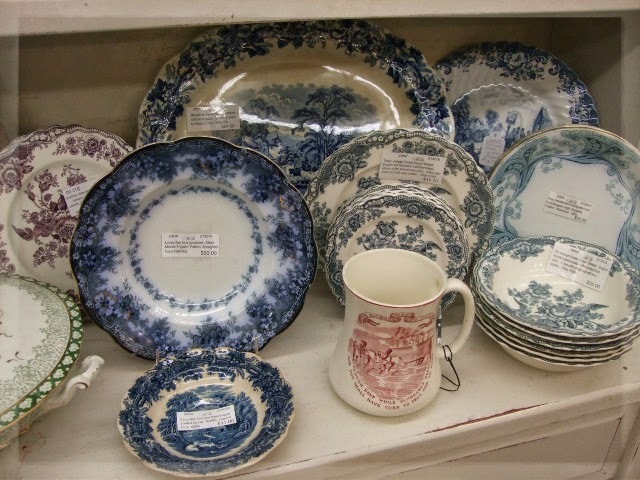 Lovely pair of Ducal English transferware dessert plates. Pattern is Bristol and in that lovely mulberry color. 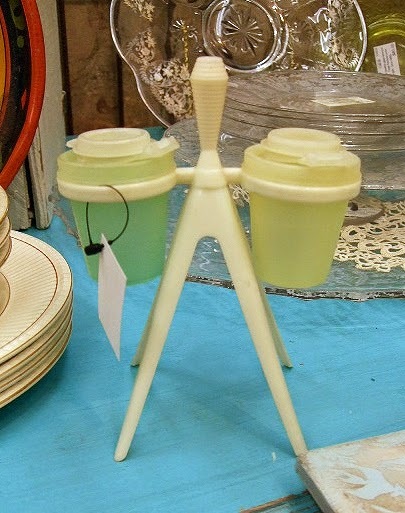 Who didn't have a tupperware salt and pepper shaker set? This very 1950s set is so delightful and is in my main space at the Buford Queen of Hearts. 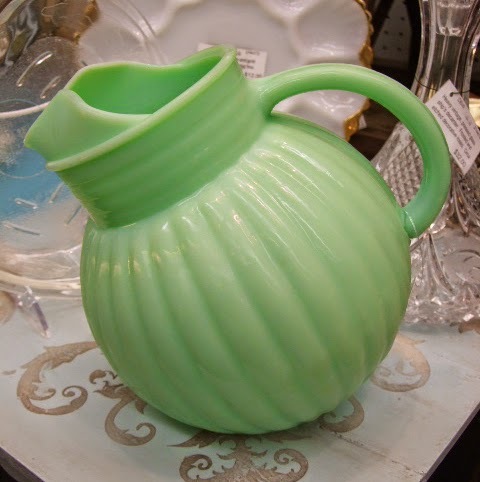 There is nothing like the minty green color of jadeite. This reproduction piece is heavy and spent about 2 hours in my space today before going home with a buyer. Nice, mid century souvenir of the Eiffel Tower. 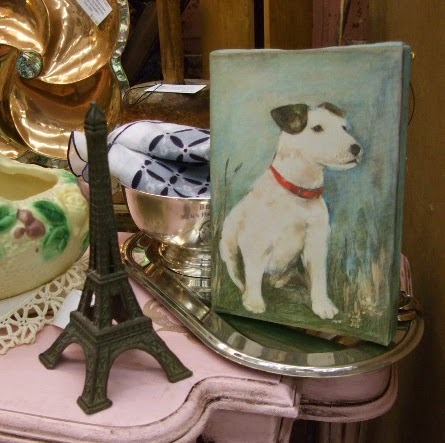 Looks sweet next to the Jack Russell Terrier picture. Love this big, heart decanter stopper. 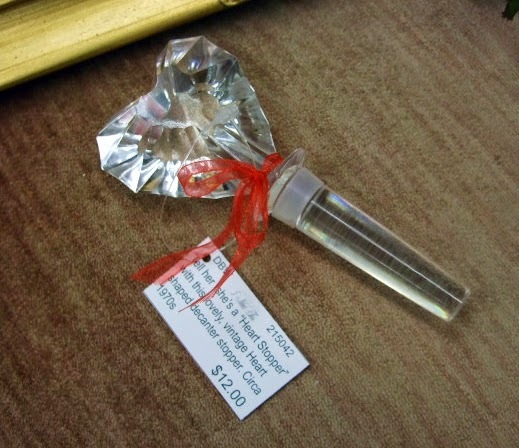 Perfect for slipping an engagement ring on, after all, she is your "heart stopper." 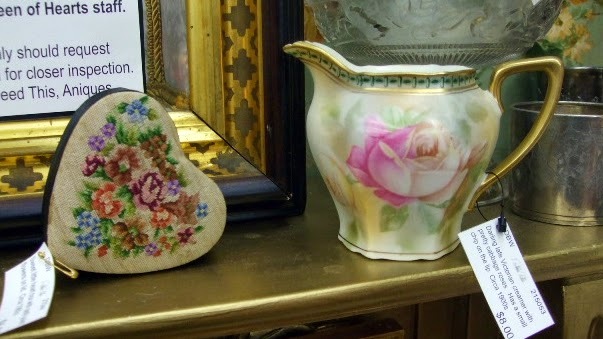 Sweet petit point heart box and a lovely cabbage roses creamer. Now this went right into my Christmas collection. I adore advertising pieces and went head over teakettle when I found this in one of my favorite dealer spaces at the Queen of Hearts. Adorable Victorian child riding a turkey. Compliments of the season. 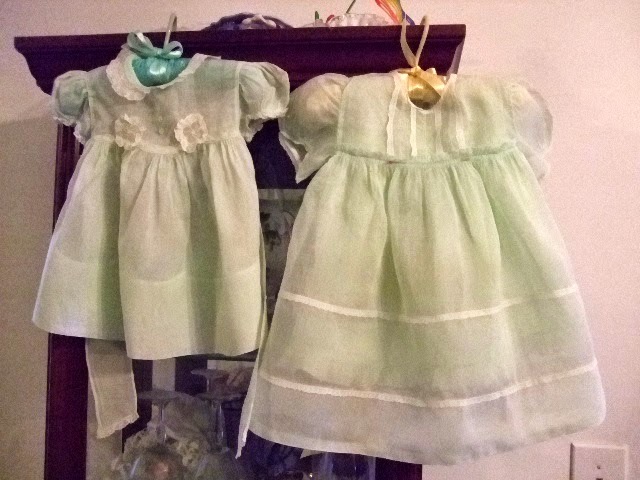 A box of the sweetest 1950s baby dresses in the palest shades of pink, yellow and mint green. 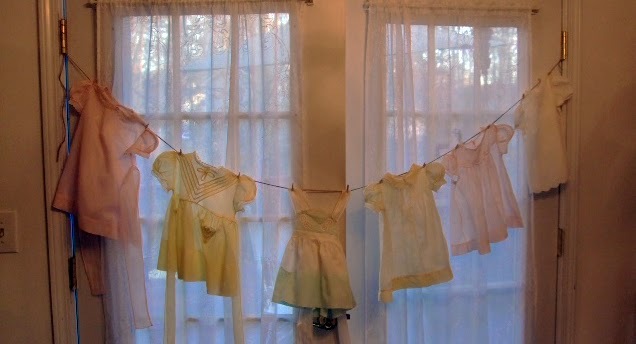 I spent the afternoon hand washing and ironing them. They are all of the finest cotton batiste with pretty frenchwork details. I will be bringing these to my space next week.